Many schools that I have worked in, which is quite a lot, have used nail boards with elastic bands to do some work on shape. Sometimes they have some plastic ones which do the same job and are less painful when you lean on them. Well this challenge is to use an idea that started with using nailboards like these but has changed into using 9 dots arranged in a square to be like a small 3 by 3 nail board. If you use three lines, (like you may have had three elastic bands for a nail board) see what triangles you can make just using these nine dots. The lines MUST go from dot to dot, (like an elastic band has to go from nail to nail). The recording of these can get very confused so I suggest that you draw each new triangle on a new set of 9 dots. There are some to print off here . One thing which makes this challenge a little different is that if you produce the same shaped triangle but place it in a different position on the 9 dots then it can be counted as being different. 1) Use three straight lines only. 2) Each line must go from a dot to a dot. 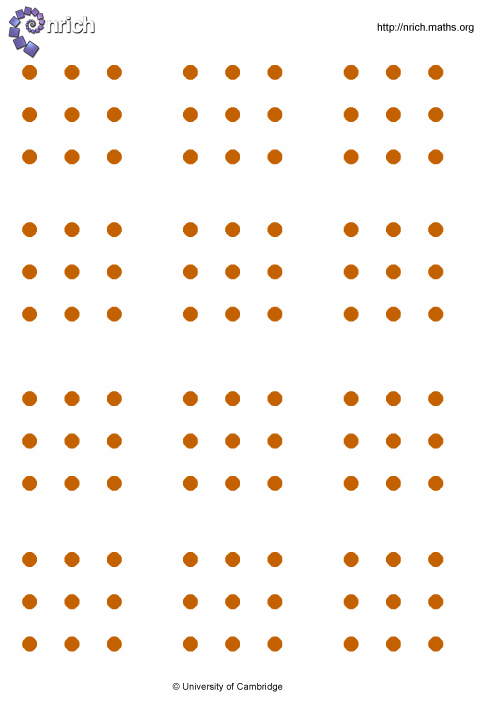 3) You can only use these 9 dots arranged as shown. Well now, what about the smallest one? Have you used any kind of system to get all the ones that are the same shape but put in different places? How many of each triangle have you found? Finally, the usual question for you to ask, "I wonder what would happen if ...?" Don't forget to send in solutions and ideas and things that you have found out. Practical Activity. Investigations. Combinations. Addition & subtraction. Visualising. Working systematically. Compound transformations. Interactivities. Pinboard/geoboard. Triangles.